Co-project of Narodnyi Prazdnik and Sergey Letov - ALTERNATIVE - emerged from the rehearsals of Theater performance "Moscow-Petushki" at Taganka Theater in 1996. It has not been included in the final version of the performance, but common rehearsals helped to realize art coexistence and interaction of Russian archaic folklore and modern instrumental improvisation. 5 singers from Narodnyi Prazdnik start to perform with Letov and Parfenov in December of 1996 (Central House of Artist, Central House of Art Workers, Screen - Internet Cafe). The next step took place in Internet club SCREEN at 19 of April 1997. The first big performance took place at the Central House of Artist 10 of May 1997 in Moscow. Besides Sergey Letov in the big multimedia project thus took part Yury Parfenov (trumpet), dancers of Expressive Body Movement Class, Alexei Borisov, Vadim Koshkin (movies, computer graphics), who participates in ALTERNATIVE. Since autumn' 1997 great Gipsy singer Valentina Ponomareva joined the group. In the concert of 5/December at Central House of Artist performed Yury Parfenov, Oleg Lipatov, Alexei Borisov, Roman Lebedev (electronics), Vitaly Bykov (vitar - a kind of sitar), Anna Koleichuk (mobiles, objects, movie), PoVSTantsy (Expressive Body Movement Class - Modern Dance), Narodnyi Prazdnik, Vadim Koshkin (computer graphics, video, cinema), Valentina Ponomareva (vocal) and Sergey Letov (idea, composition, saxophones and flutes). 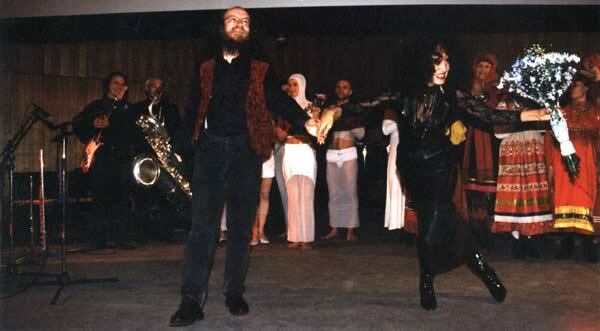 In May and June of 1998 New Russian Alternative performed at Moscow Club "Bednye Lyudi" with line up: Sergey Letov (saxophones), Alexei Borisov, Roman Lebedev, Richardas Norvila (DJ, electronics), Oleg Lipatov (electric guitar), and Dmitry Pokrovsky Ensemble - including - Olga Yukecheva (vocal), Masha Nefedova (vocal), Mikhail Korzin (vocal, violin).